Is there anything more Southern than a Derby Day party? Big hats, pretty dresses, bow ties, fancy snacks and beautiful horses come together to make the first weekend in May an event definitely worth celebrating. On my blog (and IRL) I’m all about making every day special. Derby Day gives us an opportunity to do just that! My aunt Sharee lives in Lexington, Kentucky, just over an hour from Louisville and Churchill Downs. 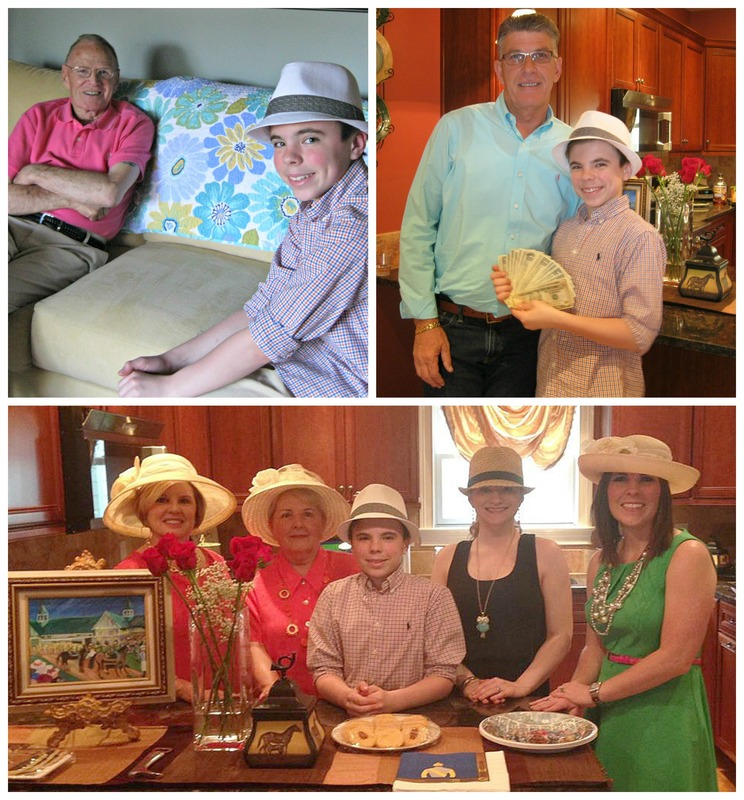 Not only does she know how to make every day special, she is also a fabulous Southern hostess! She invites all the family over to watch the Derby and they celebrate in style. Aunt Sharee graciously agreed to let me share the pictures (and her menu) from her party last weekend. Aren’t we lucky? 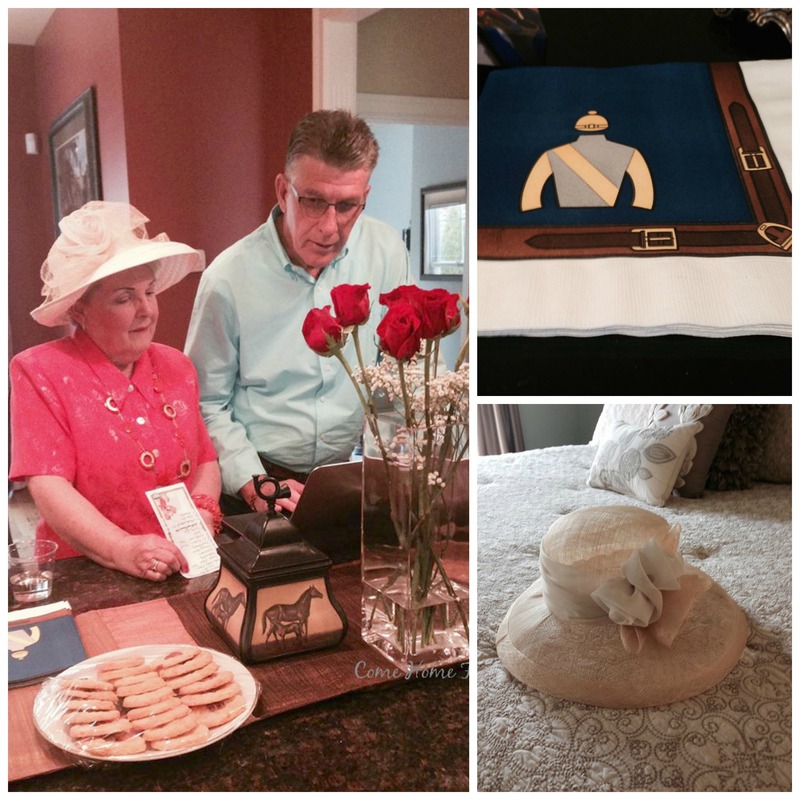 First of all – wearing big hats and betting on horses don’t have to happen just at the track. Everyone comes to the Derby party dressed for the occasion (my Nana, pictured above in pink, brought extra hats for those who don’t own any). They put the names of the running horses in a pot and each guest draws a name for $2. You can draw as many names as you want, as long as you keep adding your $2. The person with the winning horse’s name wins the pot! Nana and Uncle Tim (Sharee’s husband) are reviewing the list of horses names in the picture above. Below: My Papa is the handsome guy in the hot pink polo, next to the lucky winner! In the bottom picture, Aunt Sharee is on the far left with the girls (and the winner) in their Derby Day finest! Of course, Derby Day isn’t complete without some red roses! 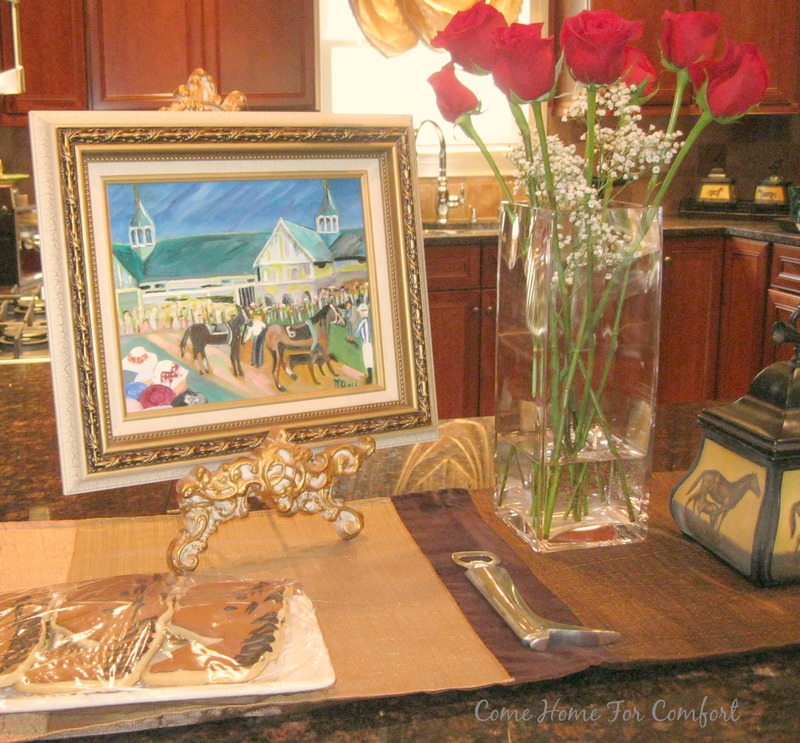 My Nana brought her original painting of Churchill Downs to display along with the roses and snacks. A perfect day at the races, without any of the heat or crowds! 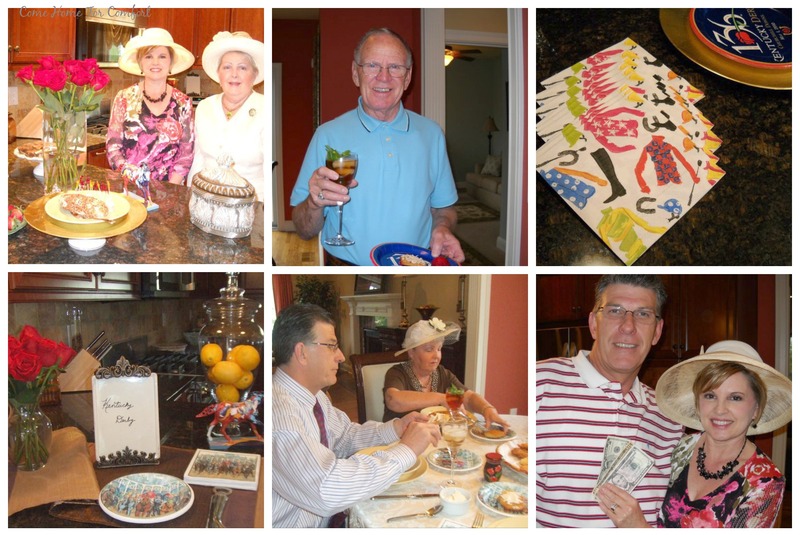 Just for fun, here are few more shots from Sharee’s Derby parties in years past. I don’t know about you, but I’m ready for a glass of sweet tea and a slice of Derby pie! 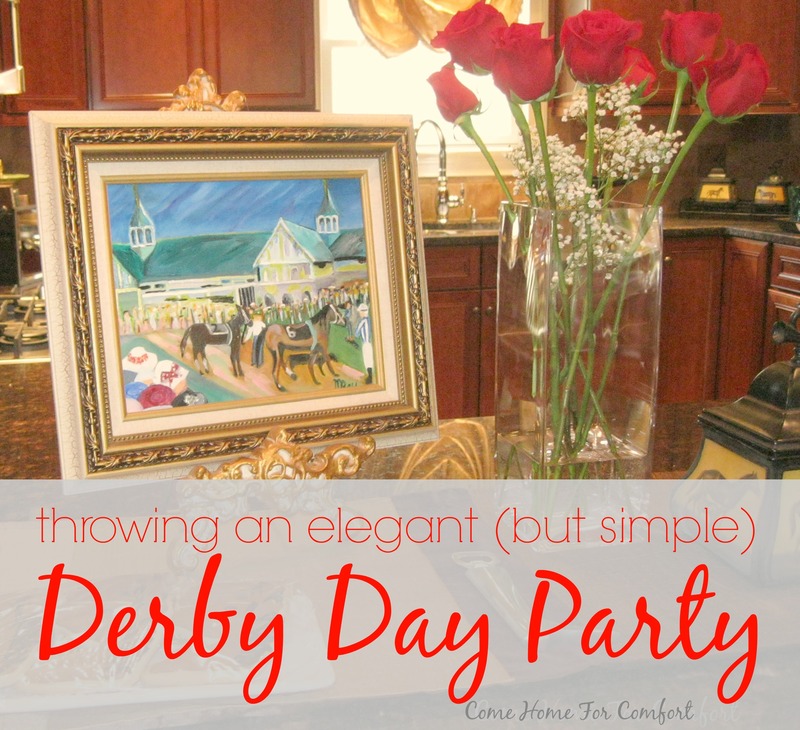 Have you ever hosted a Derby Day party? What fun. I grew up in an extended family of horse trainers, riders, enthusiasts, etc., so have always been aware of the Derby and read many stories of the famous winners! Now we’re transplants to KY, and my husband and I recently got to visit the Derby museum. Fascinating history; what amazing animals God has created. What a fun party! I feel like I’m out of the Derby loop. This is my kind of party! What a great party! Loving the cheese straws! Hi Whitney, I just hosted my first Derby Party. I loved the touch of red roses in yours and will definitely be an add on for next year. If you are interested, you can see the details of my party at http://theartinpartyplanning.com/. This was also my first blog post ever so any advice or comments would be more than appreciated! Thanks for the great ideas! We used to live in Louisville and I am familiar with the put your name in the pot !! :) However, I must say I think Lexington is more Southern and Louisville is more midwestern. As a Southern gal from Georgia, I found Louisville to be more “Yankee” than Southern. To celebrate Derby Day we usually have Derby Pie and drink coffee from our Louisville Stoneware coffee mugs. Your Nana’s party looked like it was so fun and all that yummy food!! I see where you and your mama get your entertaining skills! I agree with you Arlene, I much prefer Lexington to Louisville. Not only is it more Southern, but I’m a KY fan and can’t stand all the red and white in Louisville. Haha! Whitney, I won’t tell my husband you said that as he was a professor at U of L when we lived there.lol….We are loyal to our Georgia Tech roots.